Geno Auriemma following his team's 2013 women's championship. 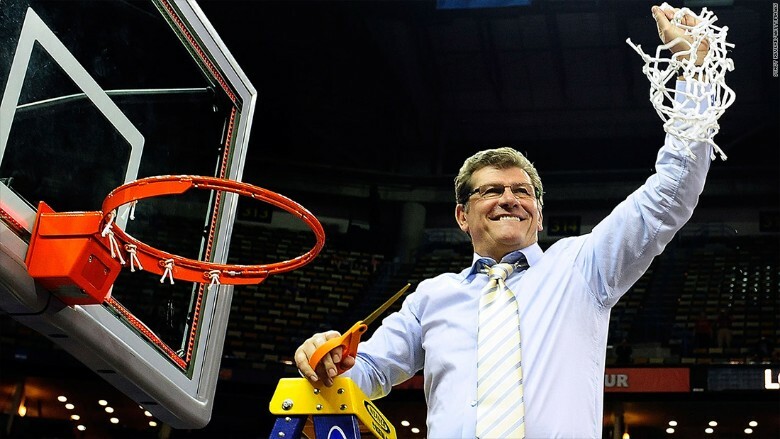 The best paid coach in women's college sports is a man: Geno Auriemma, the basketball coach at University of Connecticut. Auriemma, who will earn $2.06 million this year, the second year of a five-year contract, is also the most successful coach currently in women's basketball. Tuesday night he will be trying for his third straight national title and his 10th in the 30 years he's been coaching the team. His Huskies meet Notre Dame in the women's championship game for the second straight year. Auriemma's pay is slated to rise to $2.4 million by the 2017-18 school year, the final year of his contract. He'll be paid $10.9 million during the life of the contract, not counting endorsement deals, basketball camps, and perks like $15,000 a year car allowance and his country club membership. Auriemma had been better paid even than UConn's men's basketball coach Kevin Ollie, but Ollie also won the championship a year ago and then signed a new contract. Ollie's now getting $2.8 million. Auriemma is paid nearly twice as much as Muffett McGraw, the Notre Dame coach he's facing in tonight's game. Notre Dame is not a state school like UConn so her contract is not public record. But tax filings show that she was paid $1.06 million in the 2012-13 school year, the most recent year for which figures are available. Both coaches are among the best paid employees at their schools. McGraw was paid more than men's basketball coach Michael Brey in the '12-13 season, although she trailed the pay of both Notre Dame football coach Brian Kelly and its former football coach Charlie Weiss that year. About two thirds of the coaches in women's basketball are women, according to Department of Education figures. In most other women's sports, there are more men coaching than women. But basketball is by far the biggest revenue generator in women's sports, and thus is the most lucrative sport for coaches. Still, figures that schools file with the DOE show that most women's basketball programs, including UConn and Notre Dame, lose money on women's basketball, while men's basketball makes huge money for their schools.